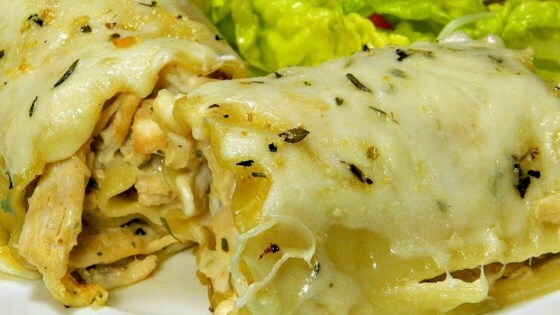 "Chicken, Alfredo, and cheese rolled up in lasagna noodles for tasty awesomeness." Combine evaporated milk, chicken, and ranch dressing mix in a skillet over medium heat; cook until chicken is no longer pink in the center, 10 to 15 minutes. Shred chicken. Bring a large pot of lightly salted water to a boil. Cook lasagna noodles in the boiling water, stirring occasionally until tender yet firm to the bite, about 8 minutes. Drain and dry on paper towels. Spread Alfredo sauce over each noodle; top with shredded chicken. Combine mozzarella cheese, bacon, oregano, and garlic salt in a bowl; sprinkle over chicken layer. Roll each noodle around the filling and place rolls in an 8-inch baking dish. Bake in the preheated oven until cheese is melted and bubbly, 30 to 35 minutes. Chicken and cream cheese star in this deliciously unique lasagna. To make your own Alfredo sauce, melt 1/2 cup butter in saucepan on medium heat. Add 1/3 package cream cheese and 1/2 teaspoon garlic. Stir in 2 cups cream, 2/3 cup Parmesan cheese, 1/2 teaspoon oregano, salt, and pepper. Increase heat and stir until thickened. Makes about 2 1/2 cups. Family says it's a keeper! I topped it with left over cheese mixture before putting it in the oven. In the recipe I used 3 small chicken breast and 2 cups mozzarella. It is one of my favorite comfort food recipes. I do not change anything. It was very good! We especially liked the chicken with ranch sauce. I made the alfredo ahead of time and refrigerated it. Then it spread well on the noodles. Will definitely make again! I used Ragu Alfredo sauce and had a little leftover as well as cheese mixture so poured on top of rolls. No substitutions. Excellent! It will be on my Christmas Eve buffet! I messed up while making them, but these recover well. Everyone loved them. Kudos.